Need More? We Are Here To Help! With all the POS solutions on the market, you are going to have questions about which is best for you. We’re here to help! See how we have helped thousands of businesses with all their POS needs. We’re sure you have questions. Let’s talk about how we can make a positive impact on your business. Our Customer Success Team is ready to get your started with a new Point of Sale today! Email our teams with any questions you may have. If outside of our normal business hours we will respond during the next business day. EMV is a smart chip technology that offers an additional step for authentication beyond the traditional magnetic stripe card payment for card-present transactions (commonly called Chip and PIN or smart cards). In addition to the security chip, which is placed inside of a reader during a transaction, EMV also verifies the cardholder’s identity with the use of a PIN or signature. The original EMV standard was created by card-granting organizations Europay, MasterCard, and Visa in 1999, and has been in standard use for credit cards in Europe and Canada. EMV technology is now becoming a global standard, with EMV compliance required of merchants and processors in the United States by October 2015. Can I be forced to use EMV chip card technology? I know what you’re thinking, “Are the credit card people going to force me to do this? I don’t have to if I don’t want to.” If you want to keep on processing cards with the magnetic stripe and say screw it to the whole EMV protocol, you are currently free to do that. You won’t lose any business, since smart cards still have a magnetic stripe as a backup. You will not be fined, and your transactions will still process as usual. But there will be one incredibly important difference: Starting in October 2015, you and your processing company will be liable for any counterfeit smart card transactions. This is what they call a “liability shift.” Since having the EMV terminal could have theoretically prevented the fraud, the liability is now on acquirers and merchants (you). Is EMV the cure-all for security? Merchants will still need to foster daily security practices and implement layered security with technologies like Shift4 Payments True P2PE™ and TrueTokenization® solutions to protect their environment from fraud and breaches. For more information on Shift4 contact a DBS representative. What does the EMV liability shift really mean? In short, the liability shift means exactly what it says. It is the change in financial responsibility, to either a merchant, bank or credit card company, should a fraudulent transaction take place. The rules for which party is left with the liability depends on what level of technology either party has. The entity with the least amount of technology is left liable. For example, if a merchant has implemented EMV technology but a bank has not supplied that technology to a credit card customer, then the bank is held liable for a fraudulent transaction during card-present transitions. If the consumer presents a chip-card and the merchant is not EMV enabled due to the ISO, then the liability falls on the credit card company. The liability shift will be enforced on October 15, 2015. From then on, all parties will have to comply with the new regulations. Can a good POS system actually pay for itself? YES!! However, you must decide on the correct system for your particular business. If pricing controls are a current problem for you, make sure the system resolves this. If you need to send targeted email marketing based on customer data collected thru the POS or a Customer Relationship Management Program (CRM), make sure the system addresses that need. 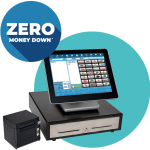 If you spend a great deal of money and time on a tedious manual process, find out if the POS system can eliminate those processes and save you that time & money. Another advantage of using a POS system in a restaurant environment is that it gives you modifier pricing control. You don’t want your staff ordering items and giving them away for FREE!! Collecting a small amount for adding tomatoes to a burger for example can add up and in the long run, and more than pay for a new POS. Interested in a career with one of the biggest point of sale providers in the country? Come join the best team available! DBS is hiring point of sale system Customer Success Technicians. Applicants must have strong communication skills and submit to a background check. Basic networking knowledge is required. Restaurant experience is a plus although not required. This is a rare opportunity to work on various point of sale systems for the biggest provider in the country. This is a full-time position with benefits provided. This position is dynamic and provides a high level of support to all of our clients by effectively answering a high volume of support related calls and often is the first point of contact for customer’s interactions with the Customer Success Team. The ACD agent is tasked with triaging their concerns, and communicating with other team members to resolve service issues. This exciting position is never slow and allows technicians to consistently learn new technologies, services, and greatly improve existing troubleshooting and interpersonal skillsets. There are also numerous opportunities to interact with different customers and businesses in this environment. This shift is 8:30 am – 5:00 pm Monday – Friday. Hours may vary based on project requirements. Must be able to work until project is completed. Applicant must be willing to participate in a rotating on-call shift. Salary is based on experience. Celebrating over 36 years of being in business, DBS has become one of the leading point of sale providers in the country. We have a strong presence in the Mid-Atlantic area, and our portfolio of over 2000 clients stretches coast to coast. DBS provides sales and support of various point of sale software technologies, computer hardware, credit card processing, security camera systems, and much, much more. Our products can be found in restaurants, hospitals, federal government agencies, and liquor stores. With the hospitality industry in high demand, our clients continue to want and use the latest technology needed to support their businesses. The entire DBS team is focused on its current mission to disrupt and modernize the state of commerce by providing businesses of every size the tools necessary to thrive. Come join a smart, motivated team and work at a leading technology company as we continue to grow. DBS has an immediate need to increase our Sales Department Team in the DE, NJ, and PA Areas. If you are a confident and highly motivated individual looking for a great sales opportunity with uncapped earning and growth potential, come join our Sales team at DBS! Applicants must submit to a background check. Banking, cold calling experience and/or restaurant experience is a plus although not required. Celebrating over 36 years of being in business, DBS has become one of the leading point of sale providers in the country. We have a strong presence in the Mid-Atlantic area, and our portfolio of over 2000 clients stretches coast to coast. DBS provides sales and support of various point of sale software technologies, computer hardware, credit card processing, security camera systems, and much, much more. Our products can be found in grocery stores, specialty markets, liquor & beer stores, gift shops, and more. With the retail industry in high demand, our clients continue to want and use the latest technology needed to support their businesses. The entire DBS team is focused on its current mission to disrupt and modernize the state of commerce by providing businesses of every size the tools necessary to thrive. Come join a smart, motivated team and work at a leading technology company as we continue to grow. DBS has an immediate need to increase our Retail Sales Department Team in the DE, NJ, MD and PA Areas. If you are a confident and highly motivated individual looking for a great sales opportunity with uncapped earning and growth potential, come join our Sales team at DBS! We are seeking energetic and entrepreneurial Outside Retail Sales Reps to market our POS systems, credit card processing, mobile marketing solutions, and loyalty rewards programs to businesses in your assigned territory. Applicants must submit to a background check. Retail sales experience is required for this position. DBS has an immediate need to add a Project Manager to our team. If you have strong communication skills, enjoy technology, and have great customer service skills, this is the job for you! Applicants must have a good driving record and submit to a background check. Computer and/or restaurant experience is a plus although not required. Basic knowledge of network topology and the ability to troubleshoot and repair PC’s is highly valued. This is a rare opportunity to work on various point of sale systems for the biggest provider in the country. This is a full-time position with benefits provided. This is a completely dynamic position, The Project Management Team is responsible for configuring, building, testing, training, installing, servicing, and offering local onsite support to customers in the Delaware, Maryland, Pennsylvania, and New Jersey markets. DBS is looking for additional help to maintain our high level of customer service as we continue to grow. Daily responsibilities include but not limited to, servicing small networked systems, database entry, phone support, and making repairs to hardware in our office and in the field. Project Managers are also responsible for seeing projects through start to finish with clients, including supporting Live and After Live onsite detail. This exciting position will never be boring and will allow technicians to consistently learn new technologies and services. While general operating hours are Monday through Friday 8:30 am – 5:00 pm, hours for this position is based solely on project requirements. Must be able to work until project is completed. Applicant must be willing to participate in a rotating on-call shift. Salary is based on experience. To fill out our online application, click here.